26 inch Cherry Quartz, with faceted Cherry Quartz Pendant, Pearls, 0.925 Sterling Silver, hook & eye clasp, and/or matching earrings. Cherry Quartz is for the Heart Chakra, with all qualities of clear quartz. It is good for colds, infections, to help concentration and for emotional balance. 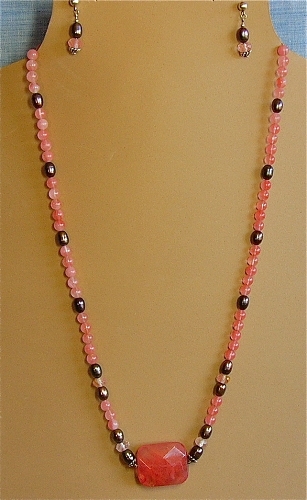 Pearls are for the 3rd and 30th Anniversary, and for a June Birthday, with Zodiac sign of Cancer, 6/22-7/22. Pearls are for the Solar Plexus Chakra to help with emotional stress.